This is an extremely competent painting of shipping in an estuary, or on a stretch of sea close to land (the marker buoys indicate that the scene is not further out at sea). The large boat in the right foreground is probably a Dutch hoy; in the 19th century these were used in and around the Thames estuary, partly for cargo but mainly for ferrying passengers about. The number of other vessels in the background, and the dimly-seen shores to left and right in the background, support this theory. The evocation of late afternoon light on the water and through the cloudscape are well-handled, and the whole scene is beautifully composed. 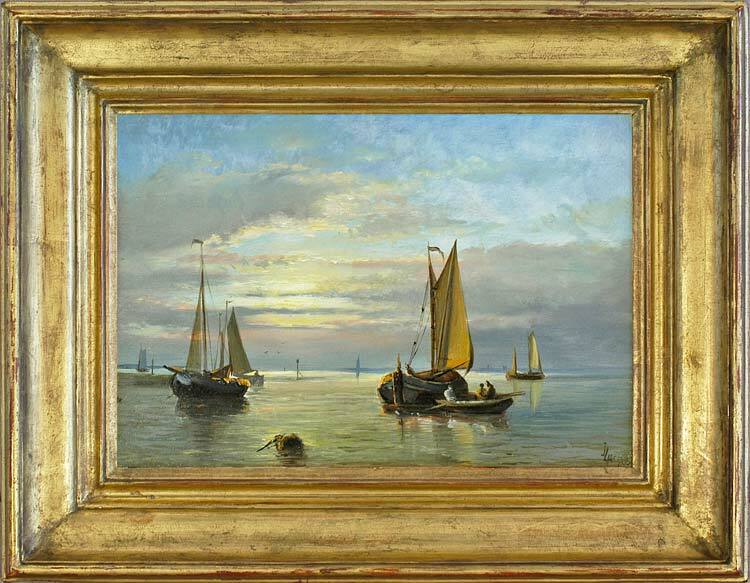 We know very little of Williamson; his other works are also coastal scenes, two of them set in Broadstairs and Brighton (dated 1877) respectively, and together with the present painting indicating that he lived in Kent or Sussex. He must have been trained, either at a school or in the studio of a late 18th or 19th century landscape and marine artist; he has a very good grasp of the technical aspects of his craft, and an ability to describe, for instance, effects of light on landscape and water. He probably did not practise as a professional artist, making his living in other ways, or might possibly have died young. He may possibly be identified with the J. Williamson who flourished between 1850 and 1919, and painted German Lifeboat U118 Stranded at Hastings Beach, 1919, Hastings Museum and Art Gallery, and Rev. Henry A. Mitton, 1904, Bradford Museums & Galleries.